The yellow-rumped siskin (Spinus uropygialis) belongs to the family of siskins, canaries and grosbeaks, the Fringillidae. The yellow-rumped siskin is distributed in Peru, Bolivia, Chile and Argentina. The siskin species are partially migratory. These siskins are monotypic. The yellow-rumped siskin (Spinus uropygialis) is a small siskin, measuring 12 to 13 cm in length and weighing 14 to 15 grams. The yellow-rumped siskin has black hood covering head, face, neck and throat. The back and wing coverts are blackish. The rump and the underparts are yellowish. The tail is notched. The bill is conical, pointed and dark gray. The legs and feet are blackish. The irises are blackish. There is a pale eye-ring. Their call is a sharp, loud twittering sound. The yellow-rumped siskin are distributed in south and central Peru, western Bolivia, central Chile and northwest Argentina. The yellow-rumped siskin species have low forest dependence. They normally occur in altitudes between 2000 to 3500 meters. The artificial ecosystems and habitats include agricultural lands and rural gardens. The natural ecosystems and habitats of the siskin species include tropical and subtropical montane forests, tropical and subtropical dry shrublands and high altitude shrublands, mountain slopes and lightly wooded plains. The diet of the yellow-rumped siskin species consists mainly of small seeds. Plant seeds, grass seeds and small insects are their primary food. They forage on the ground or on low bushes. The breeding season of the yellow-rumped siskin species is from February to May in most of their breeding range. Not much is known about their reproduction and breeding habits. These species are partially migratory birds. The breeding populations occur in Chile and Argentina. These species winter in Peru and Bolivia. There is also altitudinal migration and erratic wandering in non-breeding season. The global population size of the yellow-rumped siskin (Spinus uropygialis) has not been quantified. The overall population trend of the species is reported to be stable. In most of its range, this siskin species is reported to be fairly common but patchily distributed (Stotz et al. 1996). The generation length is 4.2 years. Its distribution size is about 216,000 sq.km. Ecosystem degradation, ecosystem conversion, deforestation, human activities in the breeding range and capture of adults and juveniles for pet-trade are the main threats that may endanger the survival of the species. The Spinus uropygialis species does not approach the thresholds for being Vulnerable either under the range size criterion or under the population trend criterion or under the population size criterion. The IUCN (International Union for Conservation of Nature) has categorized and evaluated the species and has listed it as of "Least Concern (LC)". 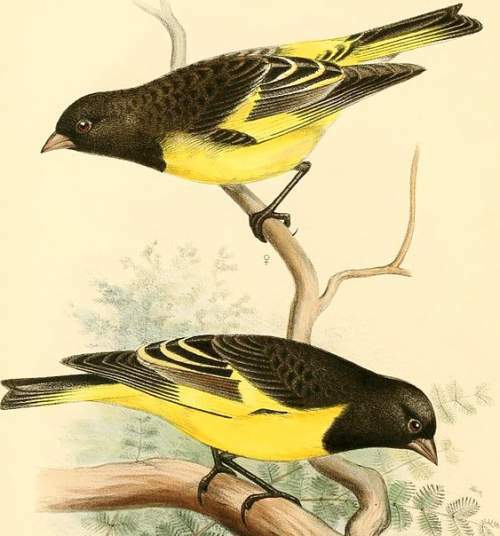 The CITES (Convention on International Trade in Endangered Species of Wild Fauna and Flora) status is ‘Not Evaluated’ for the yellow-rumped siskin (Spinus uropygialis). The yellow-rumped siskin (Spinus uropygialis) is closely related to the hooded siskin (Spinus magellanicus). It hybridizes with S. magellanicus in southern Peru. Recently updated and current topic in Bird World: Yellow-rumped siskin - Spinus uropygialis.